Bell ringers, warm ups, or do firsts– whatever you or your school might call them, they all serve the same purpose: to get students working at the start of class. 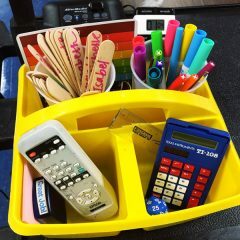 This helps communicate to students that every single minute of class time is valuable. I have found that when the first five minutes of class run smoothly, the rest of class time will run smoothly. If the first five minutes are a train wreck of questions and off task conversations, I have pretty much lost whatever impact I might have had that day. 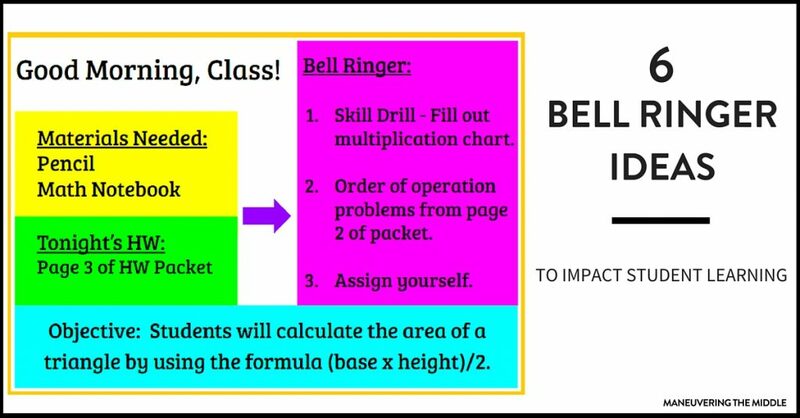 Make your life easier and have a plan for the first five minutes of class with bell ringers. 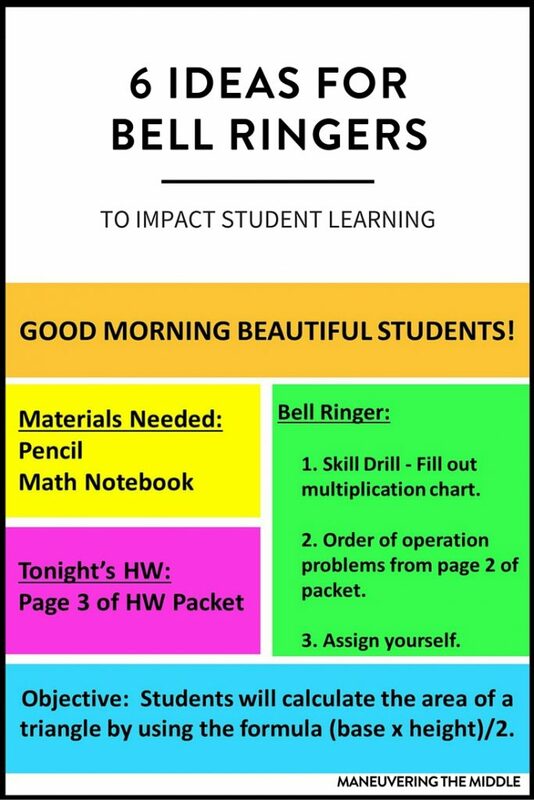 Here are a list of ways to use this time and some ideas on how to implement bell ringers. The length of a bell ringer caters perfectly for math fact drills. 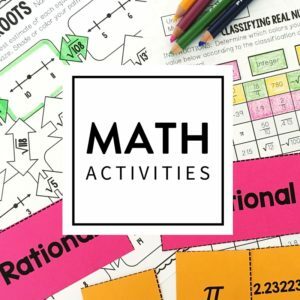 Think multiplication facts, division facts, fraction-decimal-percent conversions, geometry formulas, and other skills that will strengthen students’ automaticity in math. Why it works? Students can feel successful completing problems that they already know how to do and can do quickly. Skills drills make it near impossible for students to sit there blankly or complain that they don’t get it. Set a timer, and tell students to try to beat a certain time, and watch them go to work. I usually use skills drills everyday for the first 4-6 weeks of school. Some of the best teachers don’t require ‘review days.’ Why? Because they are reviewing every day by making it a part of their routine. I hope to reach that status soon, but in the meantime, I use bell ringer time to practice previously taught skills. I have found this to be the most successful by working on the same content for an entire week. Due to the repetitive nature of the same skill for 5 straight days, students at varying levels have several opportunities to relearn or practice the material. For example, when I create my unit plan, I choose a skill from the unit prior to spiral into my warm ups. For example, in my 6th grade classroom, I teach order of operation, prime factorization, greatest common factor, and integer operations in unit one. 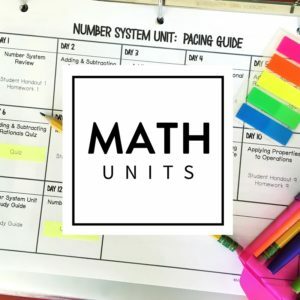 While we are in the midst of unit two, I would expose students to at least one order of operation problem for a whole week on their warm up. The next week, students would solve a prime factorization problem in the same manner and so on. Monday and Tuesday I might go over the skill to remind some of my struggling students how it is done. By Wednesday, I would have a higher level student teach the class how to solve the problem. By the end of the week, most students can practice the skill correctly and independently. 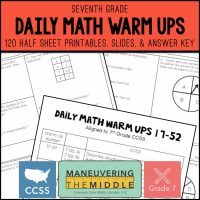 These math warm ups are easy to implement, ready to print and aligned to CCSS or TEKS. Previewing material helps many different types of learners and there is literally no better time to preview than the very beginning of class. Because students should be completing the warm up with little assistance, this should be the type of skills that students have practice before, but additional steps are going to be required to complete the objective for that day. 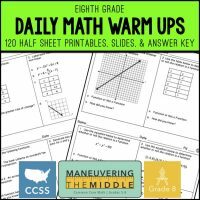 For example, on a day when students are going to be simplifying fractions, the warm up might be listing factor pairs of a number or finding the greatest common factor of two numbers. I have found that incorporating vocabulary can be another way to preview material through bell ringers. When I was in 8th grade, my Algebra teacher had an area on her board where students would write down problem numbers from the night’s homework that she needed to go over for the class. Ms. Eckles spent the first 5-10 minutes of class going over these problems. Sometimes, she went over none and jumped straight into the lesson and sometimes she went over many, many problems. If I could call this teacher up right now, I would ask her when she took attendance. (She was probably like me and forgot) I don’t do this myself, but it did seem to work. We were engaged because we wanted a good homework grade, and since classes were only 40 minutes, it combined the warm up and the homework check. Error analysis allows students to think critically and reflect on mistakes. It also helps promote a culture that allows students feeling ok making mistakes because then they are able to learn from their mistakes. If I see a common error on an assessment or homework, I will use a student example or recreate the error myself, and ask students to work out the problem on their own and identify where the mistake happened. Positive culture idea: have students correct the mistake of a celebrity. Example: Miley Cyrus was working with Ms. Brack on adding fractions. Did she solve this problem correctly? If not, explain to Miley how to fix her mistake. Sometimes you just run out of time in a class period. 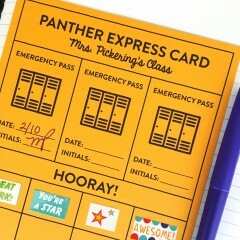 If I don’t get to the independent practice or exit ticket, I save it as an ‘entrance ticket’ to use for the next day. I might have to shorten the assignment to make it compatible for the warm up, but there is no need to come up with new material when you already have put the energy and brainpower into into creating it/working it out/printing it/copying it. Also, an entrance ticket allows students time to process the information from the day before and it might be more a more accurate way to gauge students’ understanding. 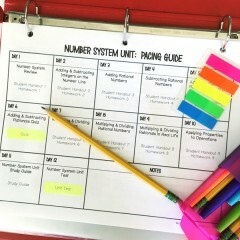 Hopefully, these six ideas provide some structure for getting your class started on time with variety. What do you do for your bell ringers? How do you utilize the time? What do you call them because I am curious? Hi Noelle! I happened upon your blog from a post I saw on Pinterest and I feel like I’ve struck gold! 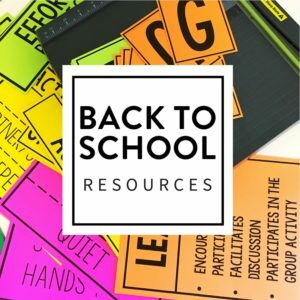 You have the most amazing ideas for middle school! I’ve been an elementary teacher for 12 years and this year, have moved to the middle school. 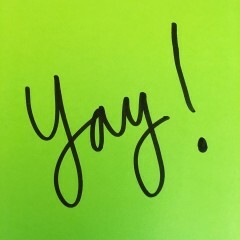 Needless to day, I’ve been in freak out mode, but your blog has been a godsend! I love your ideas and they make me feel a bit more confident in teaching 6th graders. I just wanted to thank you for your blog and ideas. I’m a follower for life, lol! What is your view on not having a warm up at all. I now only have 45 minutes to teach the same amount of content and another math teacher suggested getting rid of the warm up. I about fainted. Am I crazy? Or do you think they are almost a requirement for 7th grade math. Thanks any help you can offer would be great. P.S. BTW I taught with you at AMS but went by my maiden name Cook. Oh my goodness, Katie! What a small world! I am with you, I think I would die without a warm up. However, I will say that when I had 45 minute classes, the warm up was pretty simple and straight to the point. Rarely, did we go into a lot of detail. Also, on days that we were doing activities or stations, the warm up was typically “have all your materials out on your desk and ready to go”. But, I would say that was a max of once a week…just so they didn’t get out of the routine. How did you create your “Good Morning Beautiful Students” board. Is that a flip chart for a smart board or promethean board? 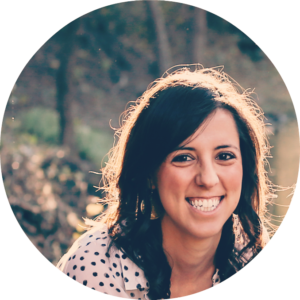 Noelle, I am such a fan of your blog (and TpT store =] ). I am a fan of bellringers as well. 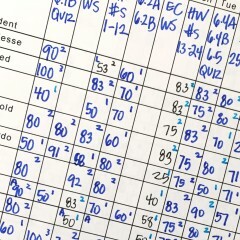 I was wondering how/where you have your classes record/keep up with their bellringers (and do you give credit for them)? Thanks so much, Jordan! At first, I used a recording sheet and collected it each week. That became a headache because I would forget to copy the recording sheet, kids would be absent, etc. The best thing I ever did was teach students on Monday to save two pages for their warm ups in their composition books. I would go around and stamp it as I checked homework, sometimes I would pass out our school incentives to students working when the bell rang. Occasionally, I would take a grade, but I really just wanted it to be more of a habit for students. 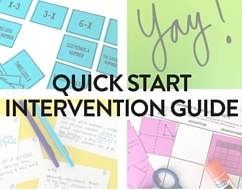 Do you ever go over/discuss warmups with students — would this be on a daily or weekly basis? Hi Lisa! I tried to go over them everyday while it was fresh on students’ minds. I didn’t work out every single one for time sake. 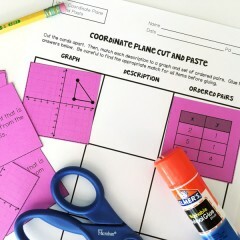 Another option is to assign students who have solved them to go to the board and show their work. Hope that helps!